Wolf Hollow and Jim Gaudet and The Railroad Boys both will be brewing up a storm on Saturday, May 19 AT 8:00 PM. BEER, GREAT BARBECUE AND JIM AND THE BOYS!!! 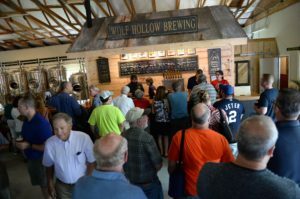 Wolf Hollow Brewing Company creates true, local, craft beer, captured on draught for peak freshness! WHBC’s regular and seasonal offerings are becoming the preeminent choice of local beer drinkers. Craft beer at its finest along with great barbecue offerings will make for fun filled Saturday night ! !